Yufang and I set out for Borders Books and Music earlier today, because they sent out 40% off one item coupons by email. I had planned on picking up one or two PKD books that I need to read for my exams. Yufang, however, pointed out to me that they had some large Lego Star Wars sets available there such as the 7674 V-19 Torrent and the 8019 Republic Attack Shuttle. The amount of savings on these two sets blasted any prearranged plans that I had for books! The Republic Attack Shuttle was a remarkable find, because I had lost an opportunity to buy one used on craigslist a few weeks ago for $30. This was a few dollars more, but it’s new and it saved me the two hour round trip time to get it for that price. 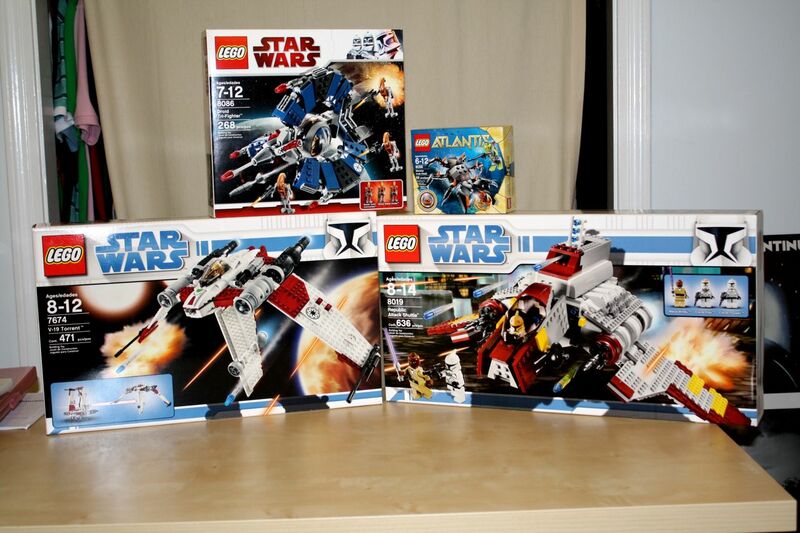 The other two sets, 8086 Droid Tri-Fighter and the Lego Atlantis 8056 Monster Crab Clash I picked up at Target, because they were on sale and had pieces that I wanted for a particle accelerator diorama that I am planning. Now, I need to finish my exams so that I can put these pieces to use. In the meantime, Yufang has assured me that she will assemble them on my behalf. Such a thoughtful wife, heh. Long time, no see! Thanks for stopping by and commenting. I’ll probably be down in Brunswick over the Summer, and I hope that we can hang out. Talk to you later.